Don’s Automotive Group owner Don Hayati and business manager Becky Rhodes display donations received for Midwest flood relief. The local community has banded together to support those impacted by the severe Midwest flooding. Donations left the Fulton County Fairgrounds on Sunday headed for Nebraska. Randy Walker, Kristi Walker, and Taylor Rupp were among those taking the donations to Nebraska. 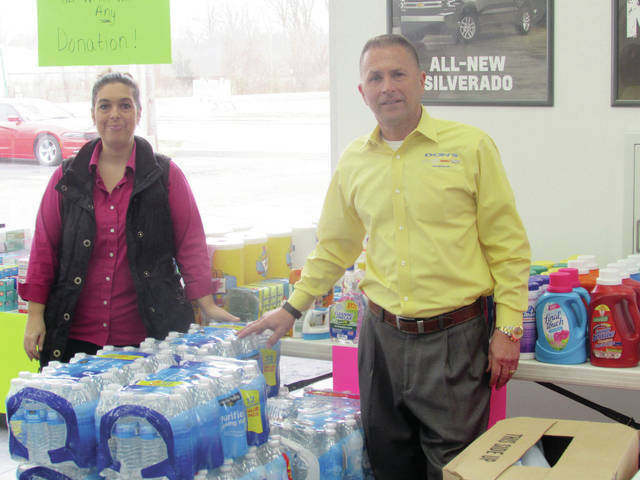 Don’s Automotive Group and the Four County Farm Bureau are leading a local effort to provide supplies to victims of massive flooding in Nebraska and Iowa. Caused by heavy rains and melting snow, the flooding has left three people dead and two missing in the two states, and caused more than $1.3 billion in damage. Some of the states’ residents are without electricity, gas, and fresh water. Becky Rhodes saw media reports of the devastation. As business manager of Don’s Automotive Group, 720 N. Shoop Ave., in Wauseon, she was determined to help. Through April 8, the dealership will accept donations in its showroom for Midwest flood relief. Rhodes said showroom space has been transformed with tables into a collection point, and is filling with contributions. “At this point, from what we’re hearing, they’re pretty much collecting everything,” she said. 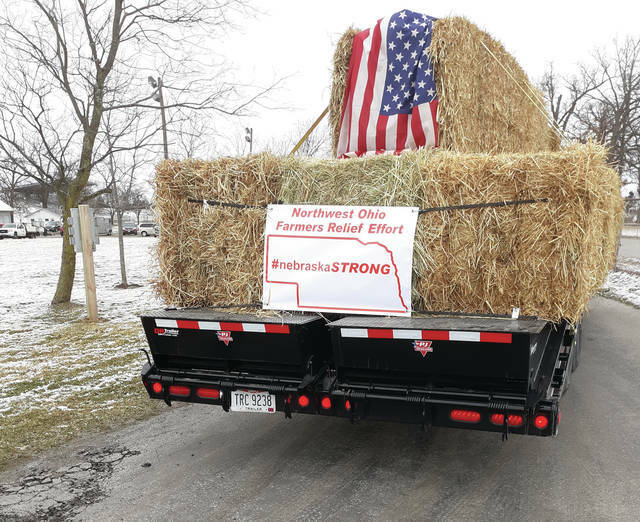 Don’s Automotive has also set up donation sites at North Clinton Church, 831 W. Linfoot St., and True North Church, 850 W. Elm St., Wauseon; Boulevard Christian Church, 7041 W. Sylvania Ave., Sylvania; Pettisville Meats, 382 County Road 19; and Lugbill Supply Center, 1396 S. Defiance St, Archbold. Donations from all the locations will be placed in individual kits and transported April 10-11 by Don’s Automotive drivers to a collection point in Nebraska. “Even just a small donation can go a long way and make a difference in someone’s day. No donation’s too small,” Rhodes said. People who bring donations to the Don’s Automotive showroom will receive a coupon for a free exterior car wash.
At 2 p.m. Sunday, 30 trucks loaded with donated farm and ranch supplies left the Fulton County Fairgrounds for Kearney, Neb. The effort was led by the Four County Farm Bureau representing Fulton, Henry, Williams, and Defiance counties. 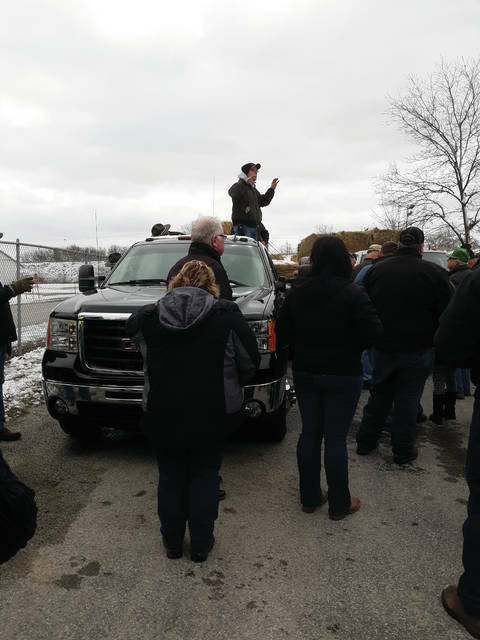 Roy Norman, Farm Bureau organization director, said an ad hoc committee for Northwest Ohio Farmers for Relief was formed only a week before. 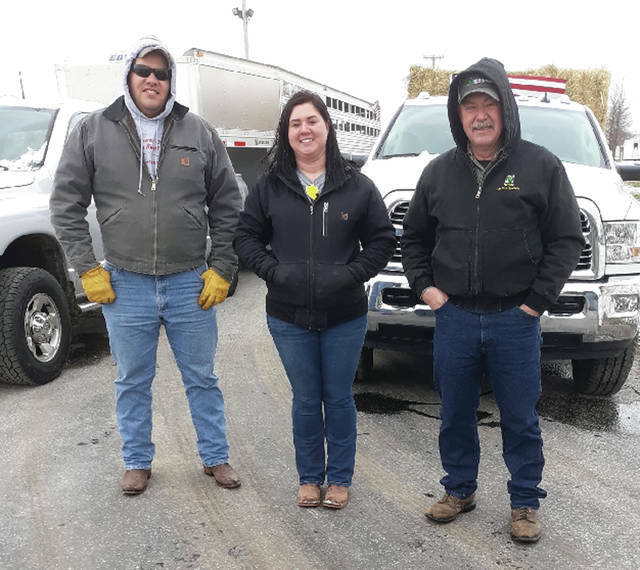 Within days, two trucks loaded with farm and livestock supplies was expanded to 30, with local farmers volunteering to drive for the 16-hour trip. Some plan to stay and help the flood victims. All will receive travel snack bags courtesy of the Fulton County OSU Extension. The donations for flood victims have poured in from farmers, community members, and businesses. The farm bureau also received $5,000 in contributions for travel expenses and to purchase some necessary items that weren’t donated. In all, the truck convoy will deliver hay, bedding, straw, protein pellets, milk replacer for orphaned animals, wood shavings, and farm and ranch supplies. It’s not too late to donate. Those looking to help can contact the Four County Farm Bureau at 419-445-0723 or visit the offices at 362 Main St. in Pettisville.